Preheat oven to 375 degrees. 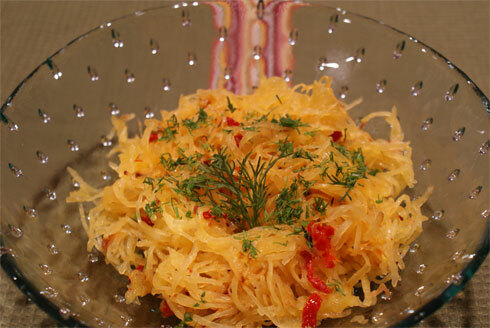 Cut spaghetti squash in half and remove seeds with a spoon. Place face down in an oven proof dish. Fill with 2 inches of water. Steam (uncovered) in oven for 45 minutes to 1 hour (until squash is slightly tender to the touch). Remove from oven and let cool to handling temp. Use fork to pull flesh out of squash in long strands. Set aside. Sauté garlic, pine nuts, sun-dried tomatoes & chicken in olive oil for 2 minutes. Toss in spaghetti squash and mix until warmed through and most of liquid from squash has cooked off (about 5 minutes). Salt and pepper to taste. Turn off heat and toss in basil. Serve immediately. You can also use parmesan, mushrooms, other veggies, bacon, meat, sausage (basically whatever you like) just start with the steamed squash and get creative!